“My Bloody Valentine”…Less Cut means more Cutting! “Beware the 14th!” hisses a cantankerous bartender working in the small mining community of “Valentine Bluffs”…and not just because you’re about to get fleeced by The Hallmark Greeting Card company! The 1980’s were, without question, the golden age of the “slasher movie”; with particular emphasis on any special day on the calendar that could provide an excuse for some maniacal killer to start hacking away at horny young people. HALLOWEEN, FRIDAY the 13th, and GRADUATION DAY were just a few of those special occasions when you’d be better off locking your doors and hiding under your bed as opposed to going out and being festive. Even the most gushy, romantic holiday of them all was not to be spared. 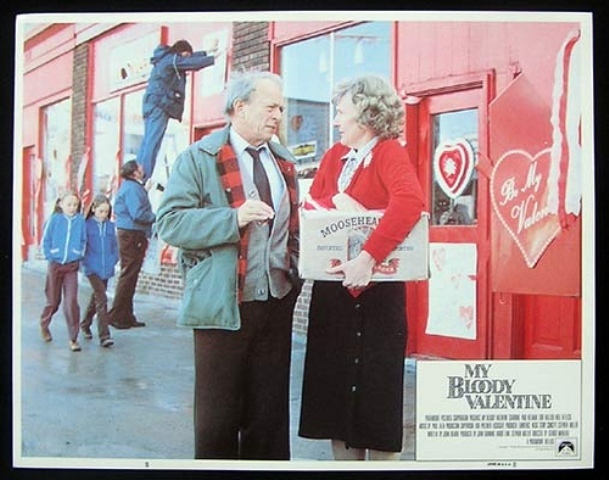 In 1981 (a damn good “vintage” so far as the wine of slashers is concerned) MY BLOODY VALENTINE hit the theaters. This Canadian entry in the slasher genre centered around a small mining community trying to move beyond its dark past – only to have it come full circle instead. Over twenty years before the film takes place, Valentine Bluffs was rocked (literally) by an explosion that trapped seven miners. By the time the frantic townsfolk were able to uncover the bodies (six weeks later) they manage to find that only one has survived – Harry Warden. No one bothers to question Harry’s luck as they uncover him in the midst of munching on one of his less fortunate compadres. Needless to say, Harry gets shipped off to a mental hospital, only to escape the following Valentine’s Day and go on a murderous rampage of his home town (yes, kinda like HALLOWEEN). Now its 1981 and the crazy kids of Valentine Bluffs want to party like its 1959! Let’s face it, unless you’re a love-struck couple that has recently found romance, most of us look at Valentine’s Day as a minor annoyance. If you’re single it makes you feel even more alone and if you’ve been committed long-term its likely you’re only celebrating to avoid sleeping on the couch. This is not true in Valentine Bluffs! Having gone twenty years without Valentine’s Day, virtually every citizen is ready to celebrate this pseudo holiday as if it were Christmas, Easter, and New Years all wrapped into one! Not only have they planned a huge dance (which by the reaction of those under 30, must represent the social event of their lives) but the town has also commissioned its very own “Valentine’s Day Decorating Committee” that takes a literal approach to the phrase “painting the town red.” Indeed, everyone is out wearing this signature color, while sporting huge grins and frolicking about like proverbial elves in a pre-Christmas frenzy. 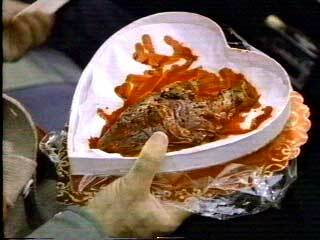 That is until the town elders receive the ultimate “forget me not”……an actual human heart! Believing that Harry Warden has returned, they decide to cancel all festivities pending his capture. Obviously this doesn’t sit well with the younger crowd who had taken this event even more seriously than their Senior Prom. 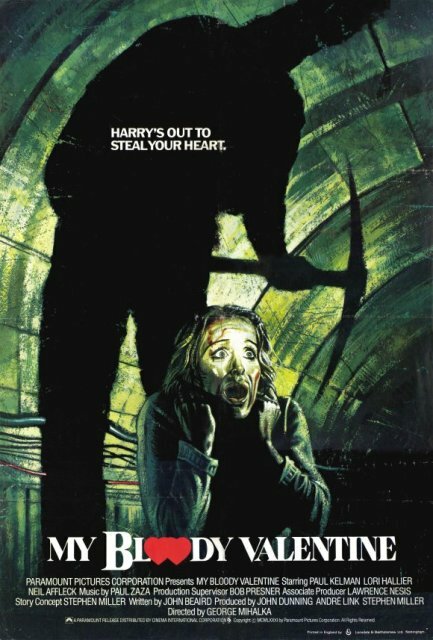 They decide to ignore the old fuddy-duddies and host their own event complete with a “tunnel of love” tour of the mines – leading to the film’s blood-soaked finale. The killer conceals his identity via a miner’s outfit which, although not as iconic as Jason’s hockey mask or the ghostly image of Michael Myers, can still garner a few nods of appreciation at any horror costume contest. In any event, a pickaxe proves to be just as formidable as a knife or machete! Amid the gallons of Moosehead beer and the town’s aging law enforcement (who do little more than stand around grimacing while wondering when the killer will strike next), there’s a love triangle between the town’s fairest maiden, Sarah, and two miners; one a Dudley Do-Right and the other the village bad boy. Anyone care to guess which one she inevitable finds more appealing? 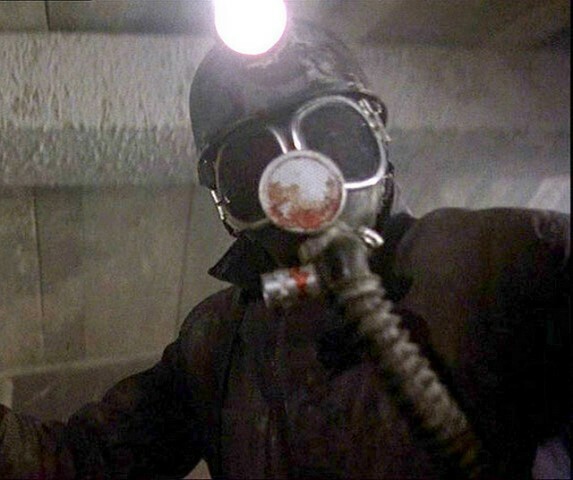 MY BLOODY VALENTINE (1981) has had two official DVD releases; the latest offering a coveted uncut version. Back before the film’s release, it got its own slashing by the MPAA who managed to hack 9 minutes of blood and gore from the original print. For years Paramount refused to heed the cries of die-hard fans demanding that the film be restored until Lionsgate (a horror friendly distribution company) bought the film and did so themselves. This version was released in 2009 (around the same time they’d release an equally fun 3D remake) and was well worth the wait. In many ways, seeing the full version was like seeing it again for the first time. 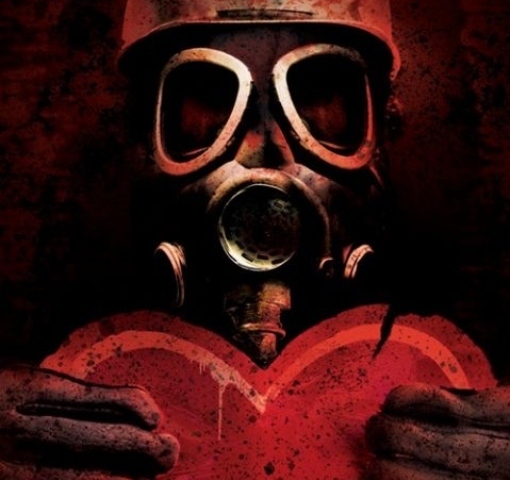 If you’re looking for a fun movie to watch with your significant other or, better still, if you are all alone this year I encourage you to pop on the original MY BLOODY VALENTINE. Trust me when I tell you, the best way to forget your own metaphorical broken heart is to see some idiot slasher character gets theirs busted for real! MY BLOODY VALENTINE with VODKA! This entry was posted in Big 80's Horror!, DVD/Blu-Ray Review, Holiday Horror, Slasher Movies and tagged Canadian Horror Films, Friday the 13th Part IV: The Final Chapter, Graduation Day, HALLOWEEN, Harry Warden, MPAA, MY BLOODY VALENTINE UNCUT. Bookmark the permalink. ← Cool Monster Toys of the 80’s – BOGLINS!! !